For the racehorse, see Main Sequence (horse). In April 2018, astronomers reported the detection of the most distant "ordinary" (i.e., main sequence) star, named Icarus (formally, MACS J1149 Lensed Star 1), at 9 billion light-years away from Earth. is the star's estimated main sequence lifetime. The most massive stars do not become red giants, instead their cores quickly become hot enough to fuse helium and eventually heavier elements and they are known as supergiants. 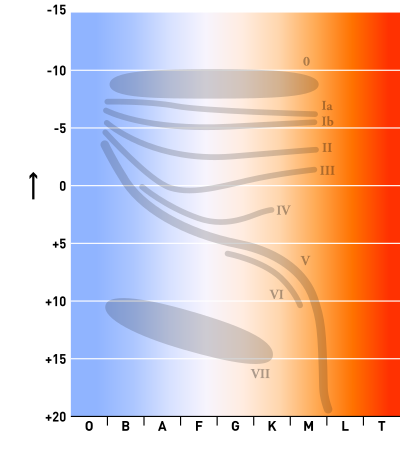 They follow approximately horizontal evolutionary tracks from the main sequence across the top of the H-R diagram. Supergiants are relatively rare and do not show prominently on most H-R diagrams. 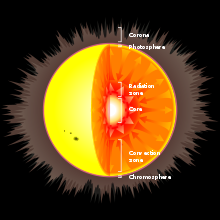 Their cores will eventually collapse, usually leading to a supernova and leaving behind either a neutron star or black hole. ^ By measuring the difference between these values, this eliminates the need to correct the magnitudes for distance. However, see extinction. 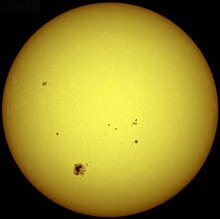 ^ The Sun is a typical type G2V star. ^ "The Brightest Stars Don't Live Alone". ESO Press Release. Retrieved 27 July 2012. ^ a b Brown, Laurie M.; Pais, Abraham; Pippard, A. B., eds. (1995). Twentieth Century Physics. Bristol; New York: Institute of Physics, American Institute of Physics. p. 1696. ISBN 978-0-7503-0310-1. OCLC 33102501. ^ a b Russell, H. N. (1913). ""Giant" and "dwarf" stars". The Observatory. 36: 324–329. Bibcode:1913Obs....36..324R. ^ Strömgren, Bengt (1933). "On the Interpretation of the Hertzsprung-Russell-Diagram". Zeitschrift für Astrophysik. 7: 222–248. Bibcode:1933ZA......7..222S. ^ Morgan, W. W.; Keenan, P. C.; Kellman, E. (1943). An atlas of stellar spectra, with an outline of spectral classification. Chicago, Illinois: The University of Chicago press. Retrieved 2008-08-12. ^ Kelly, Patrick L.; et al. (2 April 2018). "Extreme magnification of an individual star at redshift 1.5 by a galaxy-cluster lens". Nature. 2 (4): 334–342. arXiv:1706.10279. Bibcode:2018NatAs...2..334K. doi:10.1038/s41550-018-0430-3. Retrieved 2 April 2018. ^ Gloeckler, George; Geiss, Johannes (2004). "Composition of the local interstellar medium as diagnosed with pickup ions". Advances in Space Research. 34 (1): 53–60. Bibcode:2004AdSpR..34...53G. doi:10.1016/j.asr.2003.02.054. ^ a b c Kroupa, Pavel (2002). "The Initial Mass Function of Stars: Evidence for Uniformity in Variable Systems". Science. 295 (5552): 82–91. arXiv:astro-ph/0201098. Bibcode:2002Sci...295...82K. doi:10.1126/science.1067524. PMID 11778039. Retrieved 2007-12-03. ^ Schilling, Govert (2001). "New Model Shows Sun Was a Hot Young Star". Science. 293 (5538): 2188–2189. doi:10.1126/science.293.5538.2188. PMID 11567116. Retrieved 2007-02-04. ^ "Zero Age Main Sequence". The SAO Encyclopedia of Astronomy. Swinburne University. Retrieved 2007-12-09. ^ "Main Sequence Stars". Australia Telescope Outreach and Education. 25 April 2018. Retrieved 2007-12-04. ^ Harding E. Smith (21 April 1999). "The Hertzsprung-Russell Diagram". Gene Smith's Astronomy Tutorial. Center for Astrophysics & Space Sciences, University of California, San Diego. Retrieved 2009-10-29. ^ Richard Powell (2006). 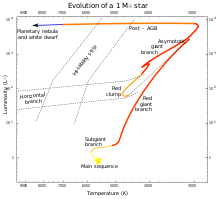 "The Hertzsprung Russell Diagram". An Atlas of the Universe. Retrieved 2009-10-29. ^ "White Dwarf". COSMOS—The SAO Encyclopedia of Astronomy. Swinburne University. Retrieved 2007-12-04. 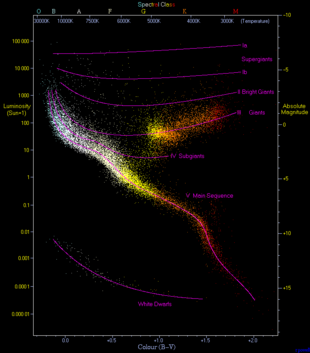 ^ "Origin of the Hertzsprung-Russell Diagram". University of Nebraska. Retrieved 2007-12-06. ^ "A course on stars' physical properties, formation and evolution" (PDF). University of St. Andrews. Retrieved 2010-05-18. ^ Siess, Lionel (2000). "Computation of Isochrones". Institut d'Astronomie et d'Astrophysique, Université libre de Bruxelles. Retrieved 2007-12-06. —Compare, for example, the model isochrones generated for a ZAMS of 1.1 solar masses. This is listed in the table as 1.26 times the solar luminosity. At metallicity Z=0.01 the luminosity is 1.34 times solar luminosity. 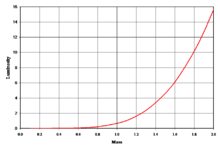 At metallicity Z=0.04 the luminosity is 0.89 times the solar luminosity. ^ Zombeck, Martin V. (1990). Handbook of Space Astronomy and Astrophysics (2nd ed.). Cambridge University Press. ISBN 978-0-521-34787-7. Retrieved 2007-12-06. ^ "SIMBAD Astronomical Database". Centre de Données astronomiques de Strasbourg. Retrieved 2008-11-21. ^ Luck, R. Earle; Heiter, Ulrike (2005). "Stars within 15 Parsecs: Abundances for a Northern Sample". The Astronomical Journal. 129 (2): 1063–1083. Bibcode:2005AJ....129.1063L. doi:10.1086/427250. ^ "LTT 2151 – High proper-motion Star". Centre de Données astronomiques de Strasbourg. Retrieved 2008-08-12. ^ Staff (1 January 2008). "List of the Nearest Hundred Nearest Star Systems". Research Consortium on Nearby Stars. Archived from the original on 13 May 2012. Retrieved 2008-08-12. ^ a b c d Brainerd, Jerome James (16 February 2005). "Main-Sequence Stars". The Astrophysics Spectator. Retrieved 2007-12-04. ^ Bahcall, John N.; Pinsonneault, M. H.; Basu, Sarbani (2003). "Solar Models: Current Epoch and Time Dependences, Neutrinos, and Helioseismological Properties". The Astrophysical Journal. 555 (2): 990–1012. arXiv:astro-ph/0212331. Bibcode:2003PhRvL..90m1301B. doi:10.1086/321493. ^ Oey, M. S.; Clarke, C. J. (2005). "Statistical Confirmation of a Stellar Upper Mass Limit". The Astrophysical Journal. 620 (1): L43–L46. arXiv:astro-ph/0501135. Bibcode:2005ApJ...620L..43O. doi:10.1086/428396. ^ Ziebarth, Kenneth (1970). "On the Upper Mass Limit for Main-Sequence Stars". Astrophysical Journal. 162: 947–962. Bibcode:1970ApJ...162..947Z. doi:10.1086/150726. ^ Burrows, A.; Hubbard, W. B.; Saumon, D.; Lunine, J. I. (March 1993). "An expanded set of brown dwarf and very low mass star models". Astrophysical Journal, Part 1. 406 (1): 158–171. Bibcode:1993ApJ...406..158B. doi:10.1086/172427. ^ Bressan, A. G.; Chiosi, C.; Bertelli, G. (1981). "Mass loss and overshooting in massive stars". Astronomy and Astrophysics. 102 (1): 25–30. Bibcode:1981A&A...102...25B. ^ Lochner, Jim; Gibb, Meredith; Newman, Phil (6 September 2006). "Stars". NASA. Retrieved 2007-12-05. ^ Wright, J. T. (2004). "Do We Know of Any Maunder Minimum Stars?". The Astronomical Journal. 128 (3): 1273–1278. arXiv:astro-ph/0406338. Bibcode:2004AJ....128.1273W. doi:10.1086/423221. Retrieved 2007-12-06. ^ Sweet, I. P. A.; Roy, A. E. (1953). "The structure of rotating stars". Monthly Notices of the Royal Astronomical Society. 113 (6): 701–715. Bibcode:1953MNRAS.113..701S. doi:10.1093/mnras/113.6.701. ^ Burgasser, Adam J.; Kirkpatrick, J. Davy; Lepine, Sebastien (5–9 July 2004). Spitzer Studies of Ultracool Subdwarfs: Metal-poor Late-type M, L and T Dwarfs. Proceedings of the 13th Cambridge Workshop on Cool Stars, Stellar Systems and the Sun. Hamburg, Germany: Dordrecht, D. Reidel Publishing Co. p. 237. Retrieved 2007-12-06. ^ Richmond, Michael W. (10 November 2004). "Stellar evolution on the main sequence". Rochester Institute of Technology. Retrieved 2007-12-03. ^ Schröder, K.-P.; Connon Smith, Robert (May 2008). "Distant future of the Sun and Earth revisited". Monthly Notices of the Royal Astronomical Society. 386 (1): 155–163. arXiv:0801.4031. Bibcode:2008MNRAS.386..155S. doi:10.1111/j.1365-2966.2008.13022.x. ^ Sackmann, I.-Juliana; Boothroyd, Arnold I.; Kraemer, Kathleen E. (November 1993). "Our Sun. III. Present and Future". Astrophysical Journal. 418: 457–468. Bibcode:1993ApJ...418..457S. doi:10.1086/173407. ^ Laughlin, Gregory; Bodenheimer, Peter; Adams, Fred C. (1997). "The End of the Main Sequence". The Astrophysical Journal. 482 (1): 420–432. Bibcode:1997ApJ...482..420L. doi:10.1086/304125. ^ Imamura, James N. (7 February 1995). "Mass-Luminosity Relationship". University of Oregon. Archived from the original on 14 December 2006. Retrieved 2007-01-08. ^ Icko Iben (29 November 2012). Stellar Evolution Physics. Cambridge University Press. pp. 1481–. ISBN 978-1-107-01657-6. ^ Adams, Fred C.; Laughlin, Gregory (April 1997). "A Dying Universe: The Long Term Fate and Evolution of Astrophysical Objects". Reviews of Modern Physics. 69 (2): 337–372. arXiv:astro-ph/9701131. Bibcode:1997RvMP...69..337A. doi:10.1103/RevModPhys.69.337. ^ Staff (12 October 2006). "Post-Main Sequence Stars". Australia Telescope Outreach and Education. Retrieved 2008-01-08. ^ Sitko, Michael L. (24 March 2000). "Stellar Structure and Evolution". University of Cincinnati. Archived from the original on 26 March 2005. Retrieved 2007-12-05. ^ Krauss, Lawrence M.; Chaboyer, Brian (2003). "Age Estimates of Globular Clusters in the Milky Way: Constraints on Cosmology". Science. 299 (5603): 65–69. Bibcode:2003Sci...299...65K. doi:10.1126/science.1075631. PMID 12511641. Bahcall, John N.; Pinsonneault, M.H. ; Basu, Sarbani (2001). "Solar Models: Current Epoch and Time Dependences, Neutrinos, and Helioseismological Properties". The Astrophysical Journal. 555 (2). Barnes, C. A.; Clayton, D. D.; Schramm, D. N., eds. (1982). Essays in Nuclear Astrophysics. Cambridge: Cambridge University Press. Chabrier, Gilles; Baraffe, Isabelle (2000). "Theory of Low-Mass Stars and Substellar Objects". Annual Review of Astronomy and Astrophysics. 38: 337. Fowler, William A.; Caughlan, Georgeanne R.; Zimmerman, Barbara A. (1967). "Thermonuclear Reaction Rates, I". Annual Review of Astronomy and Astrophysics. 5: 525. Fowler, William A.; Caughlan, Georgeanne R.; Zimmerman, Barbara A. (1975). "Thermonuclear Reaction Rates, II". Annual Review of Astronomy and Astrophysics. 13: 69. Harris, Michael J.; Fowler, William A.; Caughlan, Georgeanne R.; Zimmerman, Barbara A. (1983). "Thermonuclear Reaction Rates, III". Annual Review of Astronomy and Astrophysics. 21: 165. Iben, Icko, Jr (1967). "Stellar Evolution Within and Off the Main Sequence". Annual Review of Astronomy and Astrophysics. 5: 571. Iglesias, Carlos A.; Rogers, Forrest J. (1996). "Updated Opal Opacities". The Astrophysical Journal. 464: 943. Liebert, James; Probst, Ronald G. (1987). "Very Low Mass Stars". Annual Review of Astronomy and Astrophysics. 25: 437.